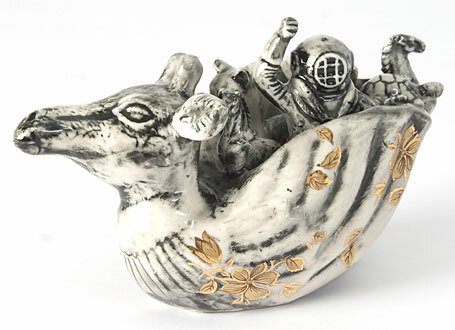 Showing now at Outré Gallery (Melbourne) is Irene Grishin-Selzer's "I Threw a Kiss in the Ocean" exhibition. 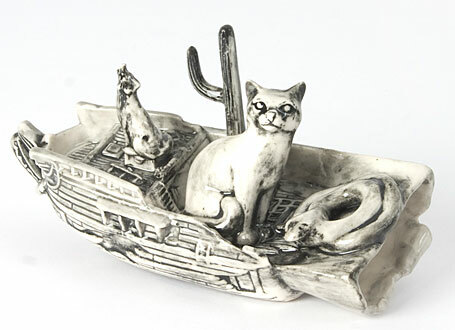 We adore Irene's work - most often seen in the form of Iggy and Lou Lou porcelain jewellery treasures, (a selection of which we have in stock in the indie art & design store! ), and featured on our blog last year when she participated in the "Three of a Kind" group show with fellow artists Beci Orpin and Madeleine Stamer. The Outré show brings together a delicate mix of the best of Irene's one-of-a-kind artworks, her limited edition sculptures and her Iggy and Lou Lou range to really show the breadth of what makes this amazing artist tick. We've chosen a selection of Irene's newest pieces to showcase in this post - works for which she took a deep breath and descended into an aquatic world populated by surprising characters and monsters from the deep. 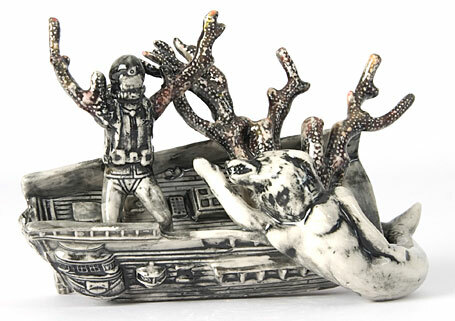 Irene's characters emerge from a world where the passing of time is measured only by an ever-growing number of barnacles collecting around sunken vessels. 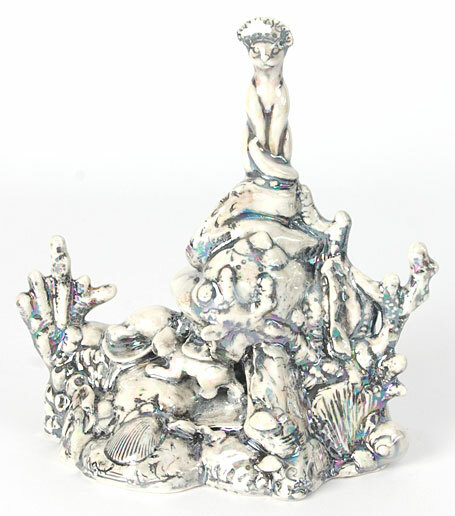 Familiar species have morphed into strange hybrids, and terrestrial creatures are juxtaposed in sculpted scenes of marine colonies. 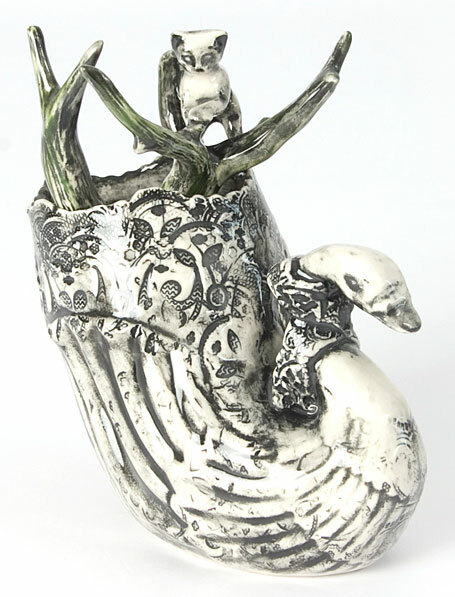 Irene has given each piece unique detailing such as the coral in "Hunter" (above) and the beautiful lace patterning which has grown over the shell surface of "Winter Swan" (pictured at top). 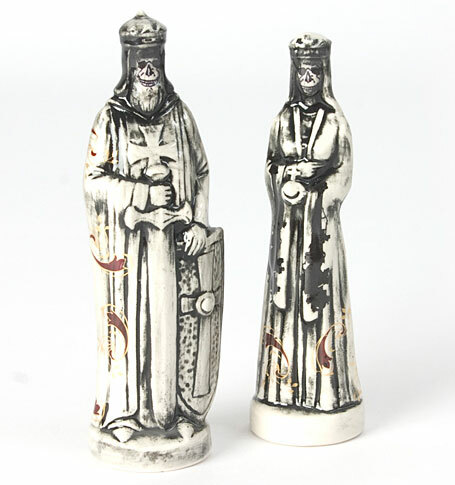 Certainly, "King" and "Queen" have inhabited Irene's otherworldly dreams for some time... Their hollow faces contrast with the rich tapestry of royal robes and decoration, exploring Irene's recurring themes of beauty & death... Each of Irene's porcelain sculptures is kiln-fired up to four times to achieve the patina of buried treasure, in this case, evoking a sense of dark nostalgia. Irene uses colour sparsely, highlighting unusual surface decoration, (patterns you might expect to find in textile design), or unexpected elements. Her limited edition and one-off artworks are sure to become collector's items, as well as personal treasures for those lucky enough to take one home. Outré can be contacted on 03 9642 5455 and further exhibition details and images can be found at www.outregallery.com/browse.aspx?Category=219. Irene's artworks and Iggy and Lou Lou jewellery designs can also be found at www.iggyandloulou.com and you can browse our selection of Iggy and Lou Lou pieces right here in the indie art & design store.